Riding mowers are great, but they have a few significant drawbacks. They’re expensive, they’re big and you’ll need a place to keep it when not in use. 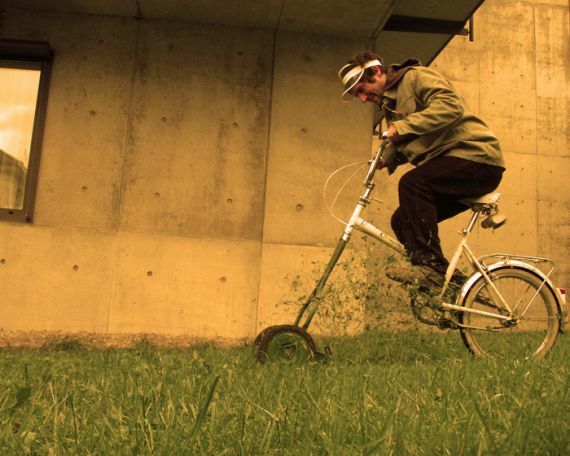 The Bicycle Lawnmower solves those problems by combining a manual lawnmower with a bicycle. Just pedal your way around the lawn, and when you’re done, you can park it pretty much anywhere. As an added bonus, pedaling your lawnmower around the yard is great exercise! Just don’t try taking it out for a ride on the street – you’ll just wind up shredding any and all trash you ride over. That is the stupidest thing I have ever heard of.